Germany has had perhaps the hardest time coming to terms with Edward Snowden's revelations of massive spying by the US and its Five Eyes allies. On the one hand, Germans are acutely sensitive to surveillance because of their country's recent history, giving rise to some of the strongest public reactions against US spying amongst any nation. On the other hand, the German government has doubtless benefitted from information gathered by the US, and is therefore reluctant to complain too much about the NSA's activities. German newsmagazine Der Spiegel said that the German Foreign Office has been systematically contacting consular authorities from every foreign nation located in Germany. In each case, the foreign consular representatives have been issued formal requests to release "through official diplomatic channels" an exhaustive list of names of their intelligence operatives operating in Germany under diplomatic cover. A small number of these intelligence officers voluntarily make their presence known to the corresponding intelligence agency of their host country, and are thus officially declared and accredited with the government of the host nation. They typically act as points-of-contact between the embassy and the intelligence agency of the host nation on issues of common concern requiring cross-country collaboration or coordination. But the vast majority of intelligence personnel stationed at a foreign embassy or consulate operate without the official knowledge or consent of the host country. Governments generally accept this as a tacit rule in international intelligence work, which is why Berlin's move is seen as highly unusual. I imagine many countries will simply add a few more names to the list of intelligence officers that they officially acknowledge as a token measure of compliance, and will then go back to spying with the rest (or just bring in some new ones that they don't declare.) All-in-all, this seems yet another move designed to prove to German citizens that their government is "taking things seriously", and "doing something", while at the same time ensuring that the "something" is largely ineffectual and doesn't harm their relationship with the US. There have been plenty of efforts by defenders of the intelligence community (including the Department of Justice) to publicly destroy the reputations of various whistleblowers, from Thomas Drake to John Kiriakou to Chelsea Manning to Ed Snowden. All of them were whistleblowers, with most leaking important information to the press. Yet they were all charged as spies under the Espionage Act, and the intelligence community and its defenders went out of their way to claim that they were the equivalent of the worst spies around, putting national security in danger, and often questioning if they were really working for foreign powers. Yet, as (former FBI agent, now defender of civil liberties) Mike German points out, it's odd how the very same people seem noticeably quiet concerning actual spies who handed sensitive information directly into the hands of adversarial governments. So how come most people have never heard of Jeff Delisle? He is, after all, an admitted Russian spy who compromised US signals intelligence for almost five years before his arrest in 2012 and whose dismissal from the Canadian military was revealed in court last week. As German notes, Delisle isn't a one-off situation either. I think to some extent it goes further. Defenders of the intelligence community understand spies who sell out to other countries. It's part of the espionage game. Whistleblowers, however, they don't understand at all. It makes them uncomfortable in a very different sense. They're used to keeping secrets. The idea of "going public" with something goes against basically their entire life's work. And, even worse, whistleblowers reflect directly back on them in a way that spies selling out to other countries don't. Spies who give information to foreign governments aren't making any kind of comment on those who didn't do that. Whistleblowers, on the other hand, are by default highlighting exactly what the rest of the intelligence community has been doing and the fact that no one else was willing to step up and call out obvious wrongs. And that's why they freak out so badly when true whistleblowers come along and treat them worse than actual spies and double agents. Many in the press still seem to have difficulty recognizing that a whistleblower, even one disliked by the government, isn't somehow an automatic pariah to society. Instead, they like to lump them in with actual law breakers. Here are two recent examples. First up is the Washingtonian, who seems to think that Ed Snowden and Chelsea Manning should be viewed in the same light as actual spies -- people who famously chose to sell secrets to our enemies or to help those enemies against the US. Lumping Manning and Snowden in with Julius and Ethel Rosenberg, Benedict Arnold, Aldrich Ames, John Walker Lindh and others suggests a profound misunderstanding of what Snowden and Manning did: releasing evidence of significant wrongdoing by the US government to the press. You would think if anyone could understand it, it should be the press. Still, I can understand how some confused people still want to argue that there's at least a continuum between some of those folks and Manning and Snowden -- even if I disagree wholeheartedly -- simply because of the releasing of classified information. I think it's very different to give that info to the press, which is then able to go through it and report on the stories (as both Snowden and Manning did) than giving it to a foreign power, but some people don't seem to get that distinction. Either way, even if you think the above chart is okay, the following one is simply outrageous. 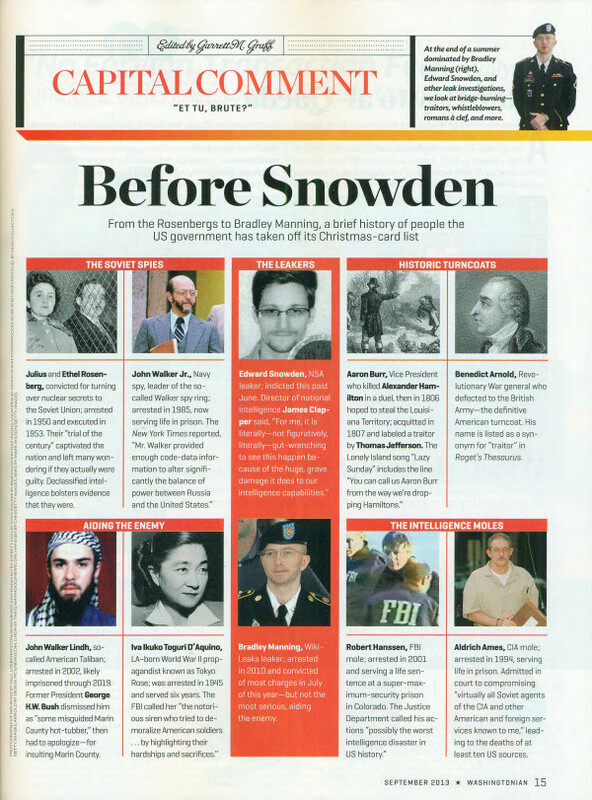 As pointed out by the ACLU's Jameel Jaffer, Time Magazine has put together a graphic comparing Snowden and Manning to mass murderers Nidal Hasan and Aaron Alexis. Yes, the argument they're making is that these are all examples of "missed signals in our government-clearance system." And we've certainly discussed how terrible the process is for getting top secret clearance these days. But, even so, lumping those four together is crazy. 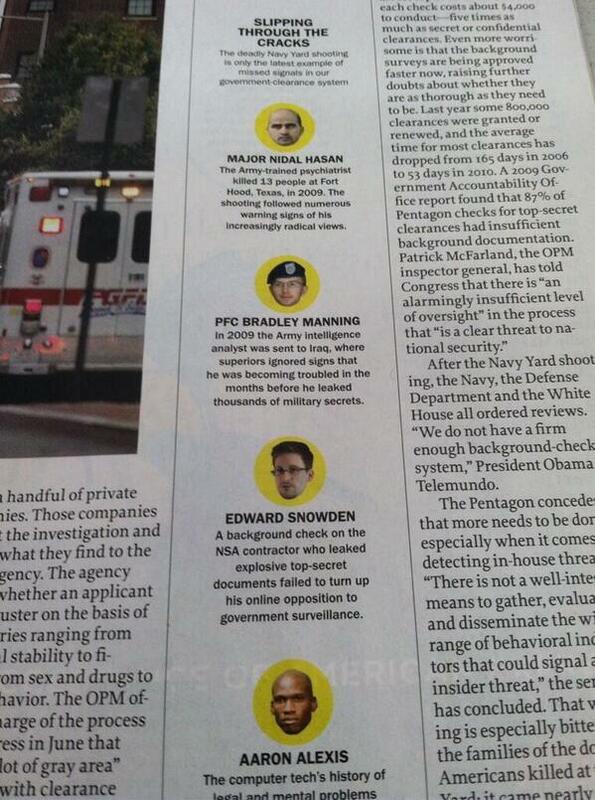 There's nothing about what Manning or Snowden did that should have set off alarm bells during the clearance process. They were people who loved America and then realized that the government was secretly doing things that they believed to be fundamentally anti-American, and they set out to try to fix that by alerting the public. That's pretty damn different than going someplace and shooting it up. These are both subtle ways in which the press is trying to smear Snowden and Manning, by lumping them in with crimes of which they are not guilty.